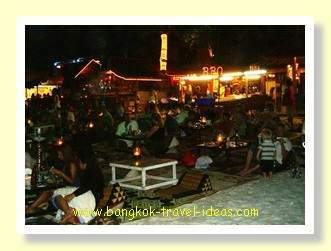 Koh Samet is one of smallest Thailand Islands, but has the best Bangkok beach in my opinion. 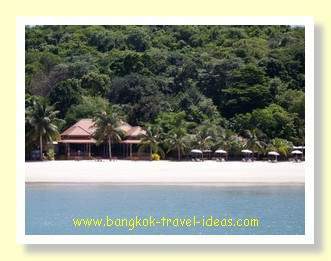 If you like the idea of a desert island retreat close to Bangkok, then I think you will like it too. Perhaps you are thinking of staying here for a few days to unwind and relax but you haven't decided yet. Well let me tell you Koh Samed is not commercial and noisy like Pattaya, but there are still plenty of things to do and more importantly it is close enough to Bangkok to be able to go for a long weekend. I detailed my last trip for you along with some photographs to give you a feel of what the place is like. In 2014 I visited Koh Samet again and some things had changed but the island was still as lovely as ever. 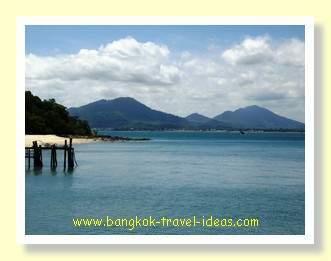 Read more about my other trip from Bangkok to Koh Samed. 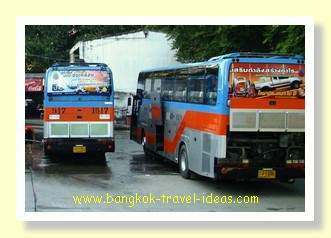 To get to Koh Samet you can take a bus from the Eastern Bus Terminal to Ban Phe and then take a ferry over to the island. The bus trip should take about 3.5 hours and the ferry ride about 20 minutes. On my last visit to Koh Samet I got up early and got a lift in a car to the Eastern Bus Terminal at Ekkamai and arrived there about 7:00 am. I wanted to be earlier to make sure that I could get the lunch time ferry, but I overslept a little bit. I have been to the island before, but always in a group, and this was my first time travelling alone. Previously I had always gone on the Cherd Chai bus and so I was familiar with where the ticket window was and I headed straight for it. As I walked towards the ticket window I heard the familiar call of, "where you going"? Turning around I spotted a man standing outside a ticket booth right at the entrance to the bus terminal and a sign saying Koh Samet. 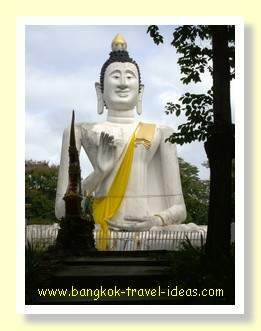 Anyway I declined his offer of a fast bus to Koh Samet and continued on my way to the other ticket window. As I left he shouted, "oh you take the slow bus". I just ignored him, but those words were to ring in my ears for the rest of the morning. I bought my ticket to Ban Phe for 178 baht and went to wait for the bus to start boarding. The bus was already there and after about 15 minutes we all boarded and were ready to depart. I shouldn't call it a bus as they are air-conditioned coaches fitted with a lavatory and reclining seats. The seats are quite close together and there is not much leg room, so if you are above average size you will find it a bit of a squeeze, particularly if the person in front of you decides to recline the seat. Once all the tickets were inspected and the complimentary bottle of water given out the coach assistant, the coach set off at about 8:00am. 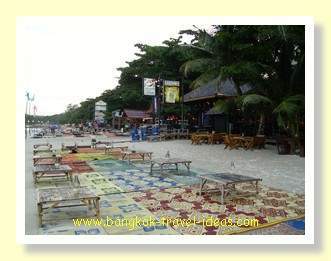 The Sai Kaew Beach Resort is where I stayed, before they completed the new extensions. Situated at the quiet end of Sai Kaew beach, but within a short walk along the beach to the night time entertainment and small range of shops, you will find this location ideal for relaxing, reading your book or just generally taking things easy. Since I have stayed in the new additional wing and the experience was just as good. 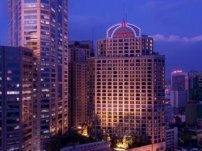 The first part of the trip is along Sukhumvit road, which isn't very interesting and then onto the overhead expressway passing through Bang Na and Bang Phli heading towards Chonburi. At the end of the expressway every bus seems to have a route of its own and they never seem to go the same way. Not recognising any of the landmarks I put on my MP3 player and my eyemask, inflated my neck pillow and went to sleep. I had the window seat and had drawn the curtains to keep from getting too hot as the sun was quite strong. As there was no one behind me I reclined the seat. I awoke at about 11:00 am and the bus was still driving, literally it was going down side streets and seemed to be dropping people at their homes. By 11:30 am I began to recognise that we were close to Ban Phe and by now most of the people had already got off the coach so there was plenty of room. Finally at 11:45 am the coach pulled into the coach terminal at Ban Phe. Next time I vowed to take the "fast bus" offered to me. 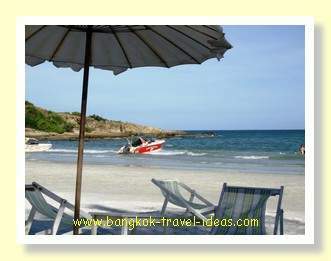 My accommodation was already booked on Koh Samet and I was going to stay at Sai Kaew Beach Resort again. I had stayed with them twice before, so I knew what to expect. Turning right out of the coach terminal I walked along the road towards the Sai Kaew Beach Resort office. Lining the left hand side of the road of Ban Phe are big markets where they sell dried fish, dried fruits, shrimp paste, wind chimes and things I didn't even recognise. I didn't go and browse around as thinking to myself, "Best to buy them on my way home." 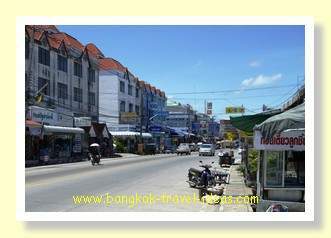 Ban Phe is a wide road but is fairly quiet as you can see. 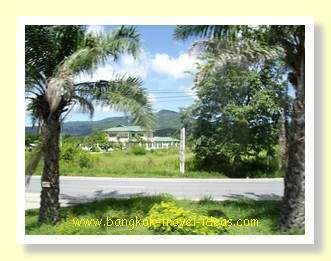 The Sai Kaew Beach Resort office is about 600 metres down the road from the bus terminus. Just go out of the bus station and turn right and you can't miss it. I arrived shortly thereafter and checked in with the lady on the desk, she ticked my name off the list and told me the next ferry was at 13:30 pm. It all seemed fairly organised to me. The ferry from Seree Ban Phe pier services all of the hotels in the Samed Resorts Group and the cost is included in the room rate. 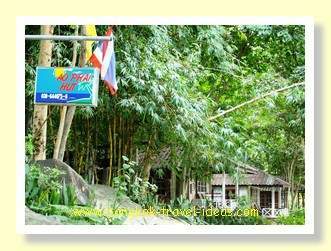 As a foreigner I had to pay 200 baht because the resort is in the Khao Laem Ya National Park. 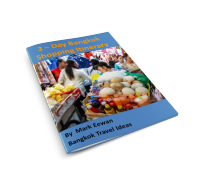 If you are Thai or live or work in Thailand you only pay 40 Baht. As the ferry left in about an hour I headed off to the 7-Eleven to get some drinks and chips and then stopped at a nearby noodle shop for lunch. Noodle soup and a bottle of coke set me back about 40 baht I think. The weather was pretty warm and humid so I was glad of being able to sit under the fans in the noodle shop, until it was time to get the ferry to Koh Samet. Returning to the office just before 13:30 pm I noticed that there were not many people going on the ferry; in fact there were only 3 people. Basically it was me and another couple, who were from Melbourne, so it seemed we had the boat to ourselves. The ferry is quite large and can carry 70 passengers and on the weekend it will be full. The ferry ride to the Na-Nai Pier took about 20 minutes and the sea had a big swell that day, usually it is very calm. It was so rough that I couldn't stand up without holding onto something. Maybe you can tell from my photographs as the horizon is not straight. 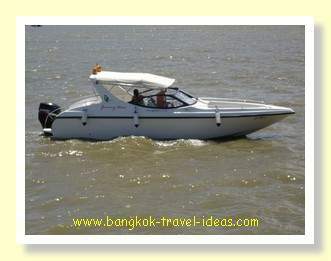 I was glad that I was in a big boat and not one of the small speed boats that take people over to Koh Samet. As we approached Na-Nai Pier on Samet island the swell subsided a little and I could see the palm fringed beaches quite clearly. After berthing we disembarked the ferry and walked to the shore to find the songthaew was already waiting at the end of the pier to take us to Sai Kaew Beach Resort. There is a 70 baht charge for this trip, that is collected when you check in at the resort. I must say the pricing is a little variable, as I have paid either 70 baht or 100 baht for two people. Or in today's case, 70 baht for just me. 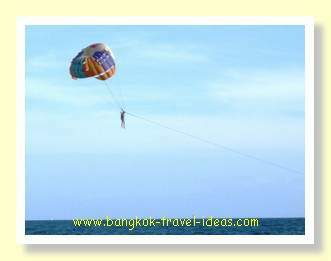 Sai Kaew Beach resort is located at the end of Had Sai Kaew beach in its own grounds, it has a swimming pool and a couple of restaurants. 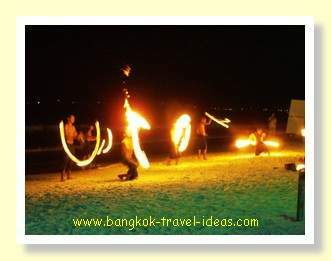 The "Rim Talay Restaurant" is located on Had Sai Kaew beach and "Rim Talay Restaurant is located near the Deluxe cabins. Both restaurants have absolutely stunning sea views. The resort has a number of different accommodation options located on two beach fronts. The Deluxe section has cabins surrounding the swimming pool and facing onto a private beach surrounded by rocks, it is really picturesque and extremely quiet here. I normally stay in these Deluxe cabins. The other rooms are in the Superior section and these rooms face onto the other beach front and are very close to the breakfast restaurant. At the time of my visit there was some building work in progress at the back of these rooms with new two storey accommodation. 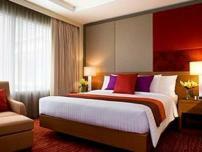 Although I had booked the Deluxe room I was put into a Superior room. As it was much closer to the beach and I hadn't stayed in them before I wanted to experience the different location. The Superior room had air conditioning, toilet and shower, TV and fridge the same as the Deluxe cabins. The main difference was that it was a little smaller and some of the floor areas were smooth concrete instead of being tiled. Anyway because of the building work going on there was a big detour to get to the other cabins so I decided to say nothing and give the room a try. The reception staff arranged for someone to show me to the room which was just a short walk away. If you decide to stay in the Deluxe cabins they will take you in the golf buggy as the distance is about 150 metres away. My room was about 20 metres from the beach but it was clean and tidy and I settled in and unpacked my bag, got changed and headed off to find some lunch. Sai Kaew beach is aptly named because of the fine white sand, it is the largest beach on Koh Samet, the water is crystal clear and beach slopes gently away so swimming is quite safe. It is one of the most beautiful and popular beaches on Koh Samet and if we had to rank Thailand's Beaches then I think it would be a strong contender. 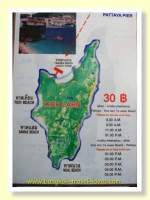 Swimming areas are roped off and outside of these jet skis, paragliding, banana boats and speed boats are in use. Even though there are numerous motorised boats the area is still peaceful and you can relax under the beach umbrellas sipping on a fresh coconut and watching all the activities. going on around you. During the day, beach traders come by selling fresh fruit, coconuts or sarongs. They are all licensed by the National Parks and their numbers are not excessive and you can just sit in the deckchair all day, just going down to the crystal clear water occasionally to cool off. If you walk up the beach about 400 metres or so you will get to the entrance to the main street in the town. 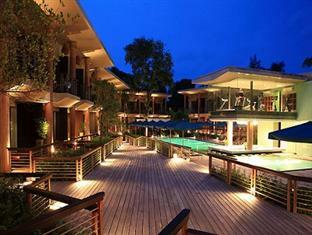 It is quite difficult to find now as it is quite well hidden between the small resorts. Go up the alley way and you will pass a little roundabout and the National Parks office. Further on is a 7-Eleven store an internet cafe, ATM and a few bars and eating places. These are really the only shops on the island. 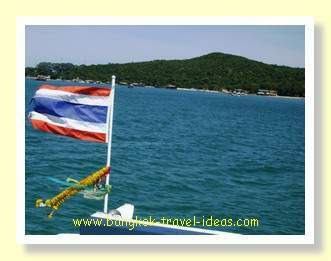 A great way to spend a few hours on Koh Samet is on one of the boat tours that run most days. You will see the advertising boards on the beach, go and have a chat to them and select one that you like the look of. One of the popular ones is Jimmy's Boat tour. They take you around Koh Samet and you stop at three different places and dive in the water with snorkels and flippers. Koh Samet is a great place to swim with large numbers of tropical fish and if you have never snorkeled then no problem, you will soon get the hang of it. There were some large groupers when we visited, these are the ones with large mouths and lips that you see on the TV. They look a bit scary because they are so large but they are harmless. The tour rounds off with a visit to the fish farm and if you like balancing on planks in the middle of the ocean you are going to love this place. Probably not suitable for little children unless you have them tethered. Actually I was surprised that nobody fell in, I am sure it must happen. If you prefer a swimming pool you need to walk back towards the Deluxe cabins and you will find it quite easily. This is a great place to relax with a book and there are plenty of sun loungers set around the pool and generally it is not too busy. If you have very young children there is also a shallow pool here as well that is just ideal. There is no safety fence around these two pools so if you have a cabin close by you need to keep an eye on the little ones as you wouldn't want them falling in. From about 4:00 pm onwards, the restaurants on the beach start to set up for the evening. They cover the sand with matting and lay out tables ready for dining on the beach. 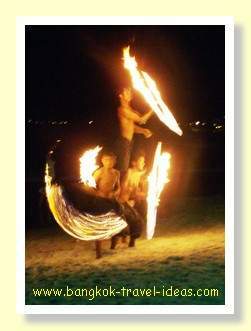 One of the popular bars and restaurants is Ploy Talay, they have a large area set aside for eating and you may have trouble getting a spot, they also have live music most nights and a fireshow at around 8:30 pm and 10:30 pm. The meals are reasonably priced and after eating you can go inside the pub watch the Filipino band and have a bit of a dance if you are so inclined. Ploy Talay isn't the only place to eat as there are restaurants lining the beach all the way along and you could pick a different one every night to eat at. On my last day in Koh Samet I wanted to see some more of the island and I rented a motorbike from the guy who is located near the Sai Kaew Beach resort reception area. As I didn't have much time I rented for just one hour to see how far I could get in 30 minutes. It cost me 100 baht for the hour and I left my drivers licence with him and signed some legal paper which probably put me on the hook for any damages and no liability for him should I injure myself. He dutifully wrapped my licence in the contract, showed me how to operate the motorbike and I was away. I rode off past the roundabout at the National Parks office and up the road. Well pretty soon the sealed road became an usealed road full of pot holes, ruts and loose stones. There had been some recent rain and it was slow going and I really didn't want to fall off. I rode for 30 minutes along the beach road and then turned around as I was running out of time. There were some nice beaches along the way and I took a few photos as I went. It was an interesting ride but I think you need at least 4 hours to get to the other end of Koh Samet and back, if you have some frequent beach stops. Well perhaps I am exaggerating a little, but at the speed I was going, it sure was going to take a long time. It is not a big island but the roads make it slow going when they are wet. Next time I might take the quad bike, I am sure it would be safer than two wheels. I certainly wouldn't attempt it with a pillion passenger or with someone who had never ridden a motorbike before. Anyway after this exciting last morning I took the boat back to Ban Phe and lo and behold the couple from Melbourne also left at the same time and we ended up sharing a car back to Bangkok. The only downside was that they got dropped off in their city center hotel and I got dropped off last, but I did go home for 500 baht in a nice comfortable limousine. 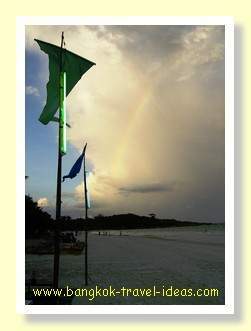 I hope you enjoyed reading about my last visit to Koh Samet and it inspires you to visit also. 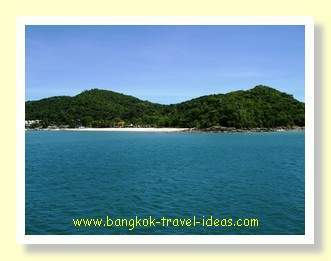 If you would like to experience one of the Thailand Islands close to Bangkok then I really recommend it and it was a great break away for a few days. Koh Samet is not the best island in Thailand, but it has one of the best beaches close to Bangkok and is easily reached by bus or car. If you are interested in staying at the Sai Kaew Beach Resort or looking at the other hotels available on Koh Samet then just follow this Agoda link to Koh Samed hotels and start to plan your next adventure. 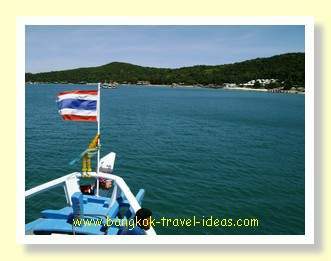 Do you need driving directions to Koh Samet? Use the map below and change your starting point.